This morning one of the cousins of my friend Sara proposed to accompany her to the Imam Square. I did not understand precisely what we were supposed to do there, but did not ask too many questions, as my (almost) nonexistent Persian and her little French did not give room for extensive dialogue. But all Sara’s family was so kind and welcoming, and her cousin showed, every time we met, a lot of warmth and willingness to communicate, that I could not say no. On the way I understood that we were going to the carpet store owned by the husband of one of her friends. Well, I had already seen several carpet stores in the bazaar, but why not? When we arrived there, one of the people welcoming us asked me in English if I would like to know the story of Persian carpets. Well, of course, but just know that I am not going to buy any, I am on a long trip and I really don’t have any place for a carpet in my luggage.. No problem, was the answer. So, here we go! First and foremost, there are two types of Persian carpets: the carpets woven by the nomadic tribes and the carpets woven in cities, following the Safavi tradition. The carpets of the Safavi tradition (dynasty ruling Persia in the 1600s, during which the first patterns for carpets were created) is what one would generally call a “Persian carpet”. They are made by hand, following a specific pattern. So one woman would weave and another would, following the pattern, dictate to the first the exact color to be used for each thread of the warp. As you can imagine, a Persian carpet woven in this technique would even need up to several years to be completed, depending on its size and the complexity of the design. They are produced in several of the historical cities of Iran. Each city has its particularities, especially with respect to the materials being used: in Isfahan they use angora wool and silk, in other cities just silk, in others, different types of wool. I must admit that I like the Isfahan carpets more, because there are not all shinny and bright as the carpets woven entirely out of silk, but they rather have just some elements of the design, a spiral flower for instance, woven in silk, standing out from the rest of the design with a delicate shine. Generally, the design of these carpets is created around one central point, from which the rest of the design evolves – it is the symbol of God, the creator of all things existing. Life expands from this one central point into simpler or more complicated spirals or chains of flowers and leaves. Inevitably we reach the border of the carpet – it is the borderline between this life and the next. Various patterns from the design of the carpet are drawn on this border, as if to say that our deeds from this life will follows us into the next. But in Iran you will also find another kind of carpets: the nomadic carpets. They are woven by the women of the various Iranian nomadic tribes. The main difference from the Safavi carpets is that these carpets do not follow a pre-designed pattern: the woman creating the carpet does not have a pattern to guide her, she weaves following a design she has created in her head. 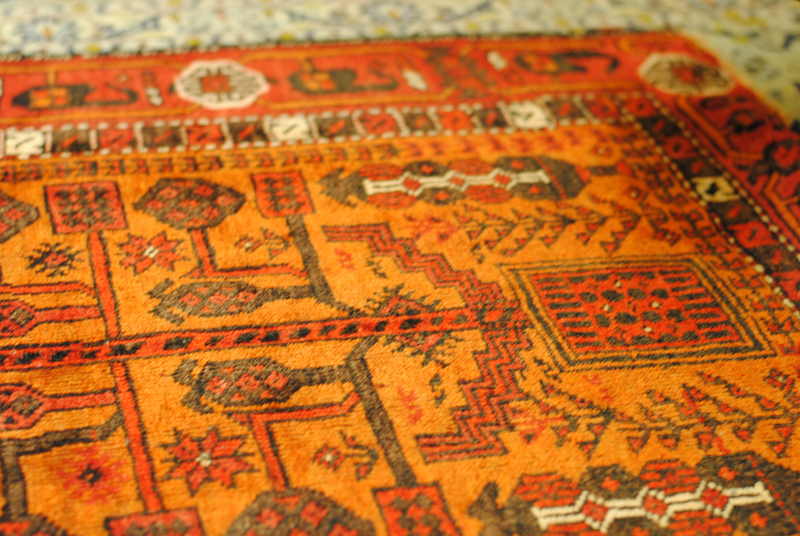 Again, tribes from different parts of Iran weave different carpets, especially in respect of the color used: in the north the colors are darker – brown, black, dark red; in the east they use more orange and bright red, while in the south you can find lighter colors, white, light yellow mingling with darker colors. Take this carpet, for instance, made in the east of Iran, close to Afghanistan. It symbolizes the tree of life, with each generation giving birth to another. Flowers, serpents (symbols of long life) and poppy flowers and seeds (as people in that region used this plant to cure various diseases) symbolize wishes of happiness, longevity and health. Young girls would weave alongside their mothers until they would be 12-13 years old. At that point, they would start weaving their own carpet and when finishing it, they would show it to the whole family – as proof that they no longer were little girls, but that they had grown into young women. Some of the patterns used by the Iranian nomads in their carpets reminded me of the carpets that my late grandmother used to weave. This thought makes me smile and reminds me of something my father told me before I left: the human spirit is everywhere the same, creating, loving, suffering in much the same way, irrespective if that person lives in the mountains of Peru or in the cities of France or on the bank of the Ganges. This entry was posted in Iran, Places and tagged Iran, Isfahan, persian carpets, travelling by Ioana Iftode. Bookmark the permalink. Love your story and love oriental carpets a lot! I’ve had a similar introduction into the carpet world during a trip in Casablanca, Morocco. Impressive work, actually it’s pure art in most of them!